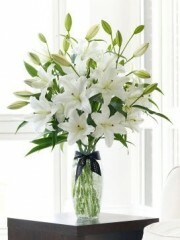 White is the colour of elegance and sophistication and is perfect for any occasion no matter what it is. 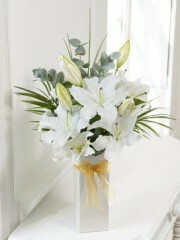 White is a popular colour for occasions such as weddings, anniversaries, birthdays, romantic occasions to name a few which is were Edinburgh flowers step in with a gorgeous selection of white flower arrangements and bouquets. The Edinburgh florists have over forty years of experience in the field of floristry under their belts so we can safely say that they know a thing or two when it comes to your orders. They pour all of their expertise and passion for floristry into your orders so you can be rest assured that with Edinburgh flowers you won’t receive anything short of perfection. The florists work with only the best flowers - which have been imported all the way from Holland, a region of the Netherlands known for cultivating premium quality flowers - as well as a huge variety of flowers including white roses, calla lilies as well as other types of lilies, gypsophila as well as many others. The florists create perfectly balanced bouquet bodies by creating the perfect harmony of flowers, lush foliage such as eucalyptus leaves as well as filler flowers. Once the body of the bouquet has been arranged in a rounded dome-like shape, the florists wrap up all the bouquets in vibrant but complementary papers, tissues and ribbons. If you have ordered a hand-tied bouquet then the flowers will come with a cellophane bubble of water which keeps the flowers hydrated and ensures they are easy to look after. If you have ordered a flower arrangement, then the flowers will come in either a vase, box, basket or teacup of your choice depending on what aesthetic you’re after. No matter how big or small your request may be, Edinburgh flowers will always do their absolute best to fulfil all of your floral wishes. Once your flowers have been ordered and if you’re seeking that finishing touch to accompany your flowers, you need not look any further as Edinburgh flowers have a lovely and versatile gifts range on offer with a gift suitable for any occasion. This gifts range includes delicious chocolates which simply melt in your mouth and are also the ideal gift for anyone with a sweet tooth; adorable teddy bears in different colours, perfect for children; fruit baskets in a variety of different sizes but all full to the brim with fresh fruits and artfully arranged by the Edinburgh florists as presentation is very important. Additionally, Edinburgh flowers stock a variety of delectable champagnes and wines - such as red, rose and white - all rich in taste. Both these beverages are widely considered to be celebratory drinks so they are perfect for any occasion from wedding anniversaries to accompanying romantic dinners on Valentine’s Day and any other occasion in between. The Edinburgh florists are also able to arrange lovely balloon bouquets which usually consist of three blank balloons and three with a fitting message for your specific occasion such as ‘Happy Birthday!’. 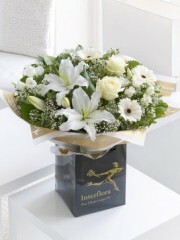 Once your order has been made, Edinburgh flowers are able to deliver your flowers for you if you so wish it. Edinburgh flowers are able to deliver your flowers not only locally but nationwide all over the UK as well as abroad to over 140 different countries worldwide. We are able to do this as the shop is part of the Interflora delivery network which affiliates Edinburgh flowers with 58000 other shops. So no matter where you need your flowers delivered, you can be rest assured that Edinburgh flowers have your back covered.